Arguing towards this research finding by Asia Foundation resonates different aspects. While the finding is very crucial for policy maker(s) to determine their policy platform, the finding doesn’t help much in crafting “institution” but it has helped a lot regarding public opinion for political parties. This research (survey) couldn’t avoid from bias and deviation within the nature of population sampling, technicality, and methodology. In a nation-state of democratic principles that consists of two-ways communication: state-people and people-state, this research is purely focusing on people-state channel, thus it is hard to comprehend the effective approach in “capacity building on state-institution”. I am keep to articulate more in “state-institution” building which importantly relies on the equity of the state-approached and people-approached participation. It is nice to read the lacking of trust of Cambodian people towards the institution with many clauses of recommendation to bringing about trust from the people. But it is a jargon to read lengthy description on people’s bad mentality towards institutional corruption without having people’s self-responsiveness to discourage corruption, for instance “no bribe, no corruption” etc. Cambodia is lacking nation founding father. Cambodia is fulfilled personal-cult founding fathers. 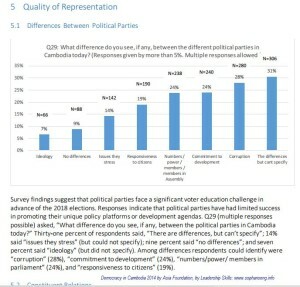 By evidence, founding father have projected long term interest for the nation such as paving strong foundation for Cambodia as a nation-state to having strong institution accounting from neutral media to educate the public, to political parties system of sound balanced government party leadership and opposition party leadership, to building trust in between state and society etc. Now, government leadership party can enjoy all the provisions in term of party’s base of people-networking, media and financial injection, the opposition party is non-available at all in term of state’s funding while the party has wholly relied on generosity and donation in kind from the members. This kind of political system is not existing in civilized democratic countries. And this culture of non-equity political system shall not sustain Cambodia in its long term democratic system at all. Interestingly, the research didn’t involve itself towards the new political concept and philosophy conundrum of “Culture of Dialogue” at all. It is probably the concept itself is too complicate for the researches design or the researchers missed to add into their questionnaires just one clause or one word “culture of dialogue”. I am keen to see the researches related this to their questionnaires so that “social capital” of “trust” might be enriched among those respondents. To recap, I copied and pasted the key ideas in here for everyone to digest more. The research is shedding light towards political parties, academia and news outlets. It is hugely benefiting those “think tank” to think about embodying themselves to be “nation founding father”, or at least “to avail themselves for critical thinking” through word of mouth, facebook, blog, workshop, writing to the editor, or other simple sharing etc. 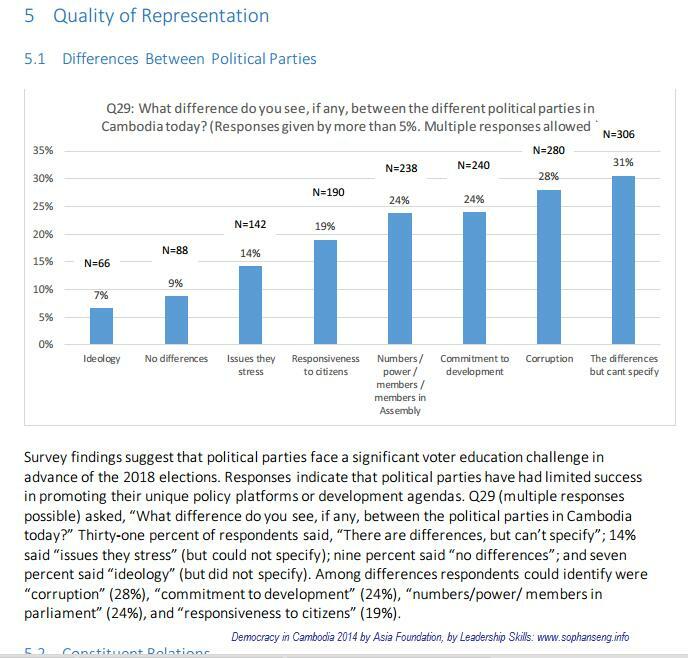 Democracy in Cambodia2014 …the majority of respondents in the 2014 survey said the country is headed in the wrong direction. …the survey findings suggest the July 2014 agreement was popular on at least two accounts: first, the majority of respondents support a constitutional amendment to provide for a “balanced” National Election Committee; second, the majority of respondents believe that electoral reform should take place before elections.